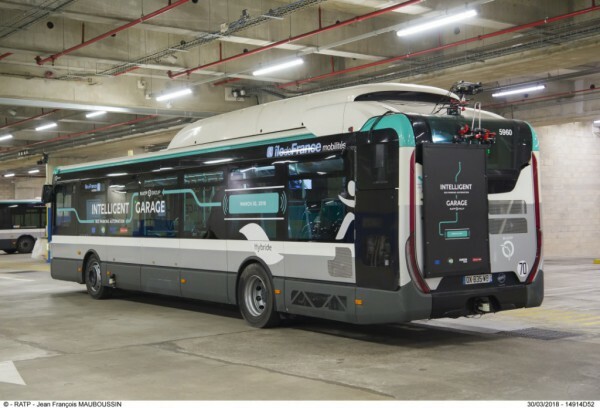 RATP has an Iveco that drives itself within depot confines, but it is pushing on with the bus2025 programme that will see battery electric or biogas power all new purchases by 2025. The automation project involves three parties: RATP, the French Alternative Energies and Atomic Energy Commission, and Iveco. A 12m Urbanway hybrid has been fitted with cameras for navigation of Lagny depot, and it has five radar sensors for obstacle detection. Lagny is a multi-level underground facility and GPS use is difficult. The on-bus control system thus includes a pre-programmed map of the depot and several distinctive murals are painted in various locations to allow the cameras to calibrate their position. The result is a self-driving bus. Lagny is organised with numbered reverse-in parking spaces, and the Urbanway can proceed autonomously from the street access point to a number of them, and vice-versa. As a proof-of-concept exercise, a driver is present while those manoeuvres take place. However, during a recent press demonstration, the Urbanway found its way to Lagny’s basement and parked itself perfectly between two of its sisters. Development of a self-driving capacity is part of the EU’s European Bus System of the Future project, from where some funding has been received by RATP. On-bus control equipment means that it is dedicated to the trial, but prior to selection it was a regular member of RATP’s fleet. Although the Urbanway can drive itself, RATP has no aspiration to take that capability to the streets. Instead, it sees autonomy as a means of making more efficient use of the driver resource, says Project Manager Autonomous Vehicle Clément Lucchesi. A further gain is an end to damage that can occur during tricky manoeuvring.